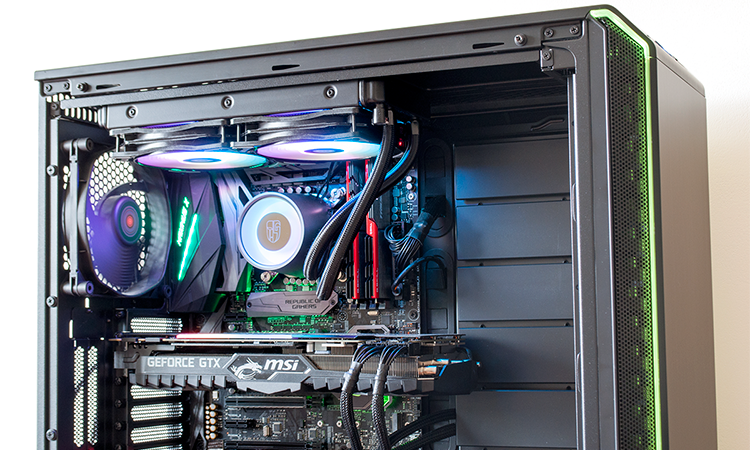 Love it or loathe it, RGB lighting has spiced up all manner of PC components. Traditionally mundane memory kits now sparkle, the latest motherboards have taken on a whole new ambience, and even CPU coolers have evolved from monotonous to mesmerising. And why not? Plenty of big-spending enthusiasts pay attention to the appearance of their rig, and if you're wanting to make a statement, take a closer look at Deepcool's latest all-in-one CPU cooler, dubbed Gamer Storm Castle. Available in both 240mm and 280mm flavours, the Gamer Storm Castle is designed to appeal to RGB aficionados and pricing is competitive at £96 and £120, respectively. We have the smaller of the two offerings in for review today, and while a lot of the Castle 240RGB feels familiar - it's that same ol' formula of radiator, pump and fans in a single closed loop - the eye-catching pump design is worth talking about. 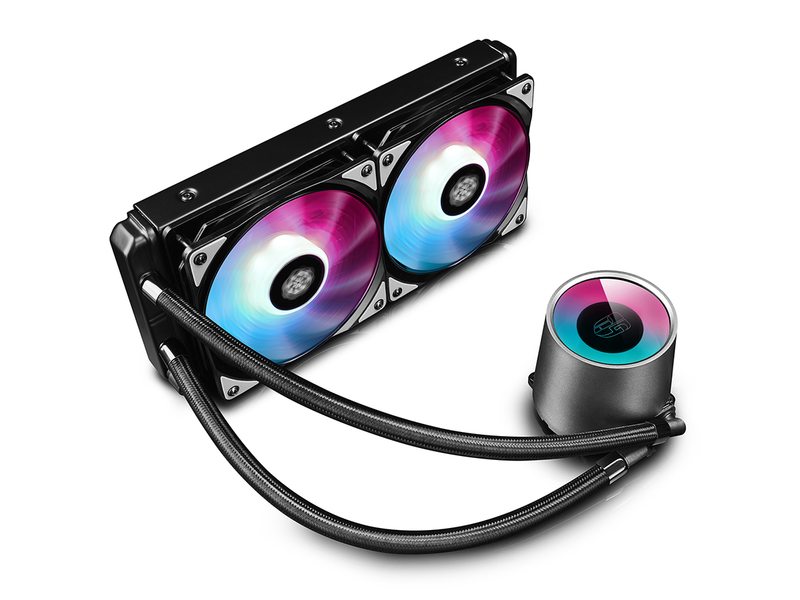 Whereas most manufacturers have attempted to shrink the pump for a more conservative overall profile, Deepcool goes all out, with a bigger unit that stands 71mm tall on the CPU socket. It feels unusually broad to begin with, but there are benefits to the oversized design. From an aesthetic point of view, the top portion of the pump employs "double window panes," giving the effect of a large void that illuminates with light. We've seen pretty pumps before - NZXT's Kraken and Cooler Master's MasterLiquid RGB come to mind - but credit where it's due, if you're partial to RGB effects, the Castle Series is the best we've seen. What's more, the top of the pump carries an elegant mirror-like finish when the lights are turned off, and the silver plastic surround looks the part in our Z370 test platform. 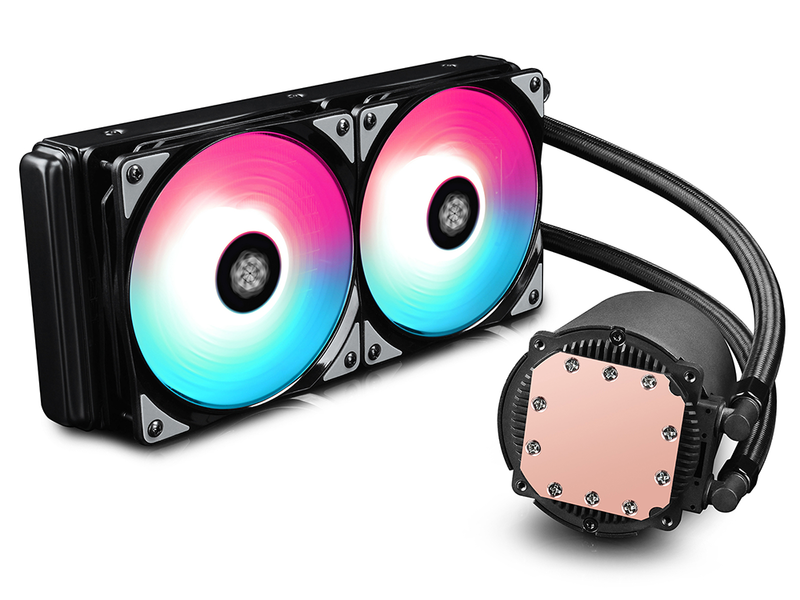 If you can't comprehend why a CPU cooler needs to be pretty, you'll be pleased to hear that there's a functional advantage to Deepcool's hefty pump. On the underside, there's room for a 550mm-wide copper block that's able to provide coverage for all the latest CPU sockets, including AMD's gargantuan Threadripper. The pump is the key talking point but the rest of the package is similarly tidy. 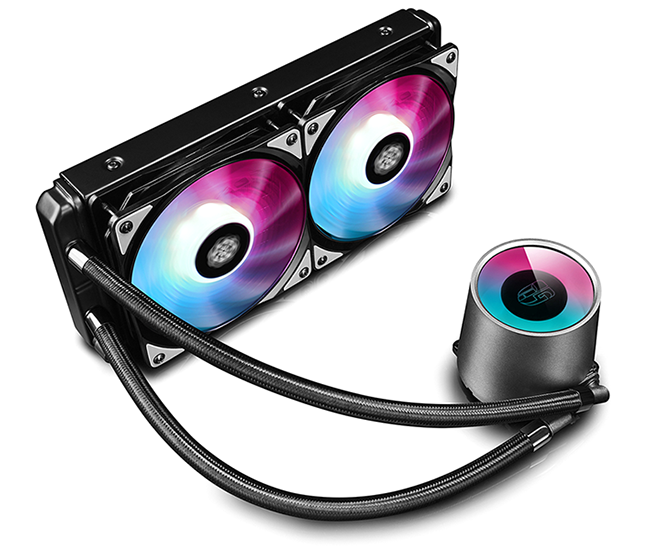 A 274mm x 120mm x 27mm aluminium radiator is connected via flexible braided tubing that's just the right length, and the duo of 120mm PWM fans extend the RGB effect while operating at speeds of up to 1,800RPM. 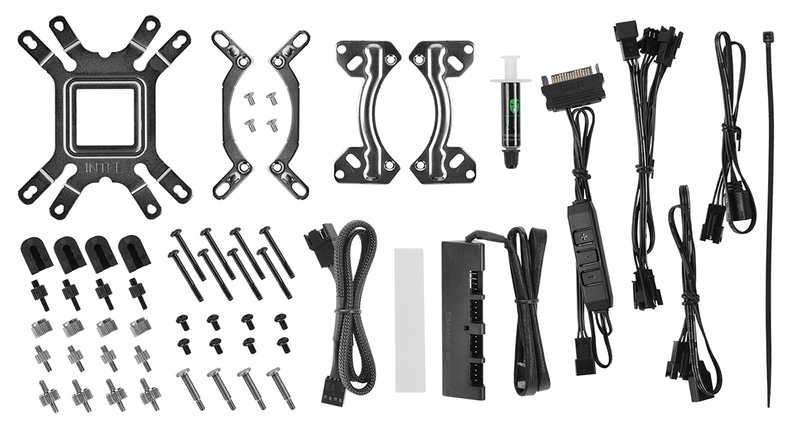 Mounting the kit is much like most other all-in-one solutions. The pump is secured to the CPU using the appropriate backplate for your socket, though it's shame there aren't standoffs to hold the bracket in place while the pump is positioned. It's a case of manually aligning the two parts that sandwich the motherboard, but don't worry if it goes awry as Deepcool bundles a small tube of thermal paste that's good for at least a couple of installations. Wiring is where things get a little more complicated. 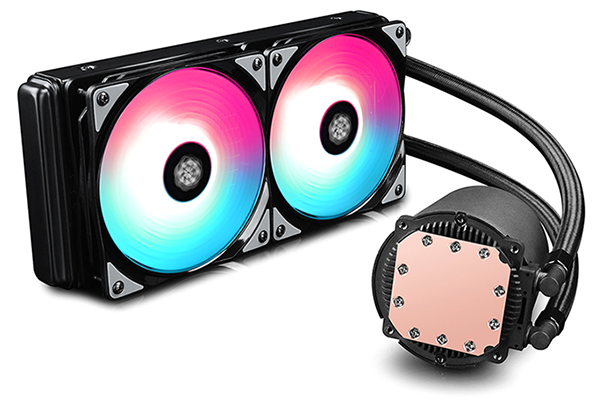 In addition to the three-pin pump header and four-pin PWM fan connectors, there are three-pin RGB cables emanating from each of the illuminated items. In an effort to manage clutter, Castle 240RGB is shipped with a few useful accessories. 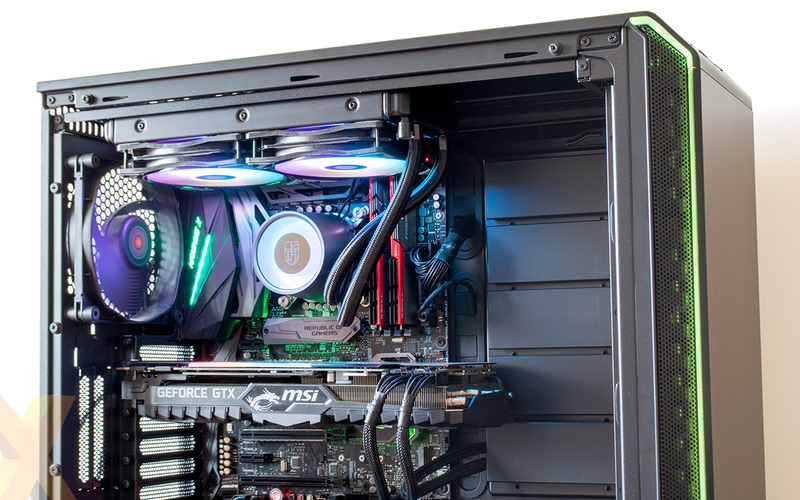 There's a four-way PWM hub for connecting the fans to a single motherboard header (the four ports are useful if you plan to upgrade to a push-pull configuration), a SATA-powered lighting controller that can be installed if your motherboard lacks RGB headers, or alternatively there's a four-way RGB splitter for connecting the fans and pump to a single addressable port. Do be aware that Deepcool doesn't offer a software utility of its own, so customisation of effects and colours is reliant on either the buttons on the hardware controller or, preferably, your motherboard's lighting app. Synchronised effects are supported on compatible motherboards from all the major brands - Asus, Gigabyte, MSI and ASRock - and the addressable LEDs create some of the best eye-candy we've seen on an all-in-one CPU cooler. The only caveat, in our estimation, is the black Gamer Storm logo on top of the pump lid, which a) isn't a great logo and b) detracts from the overall aesthetic. That's the preamble out of the way, now let's find out if performance can match the looks.